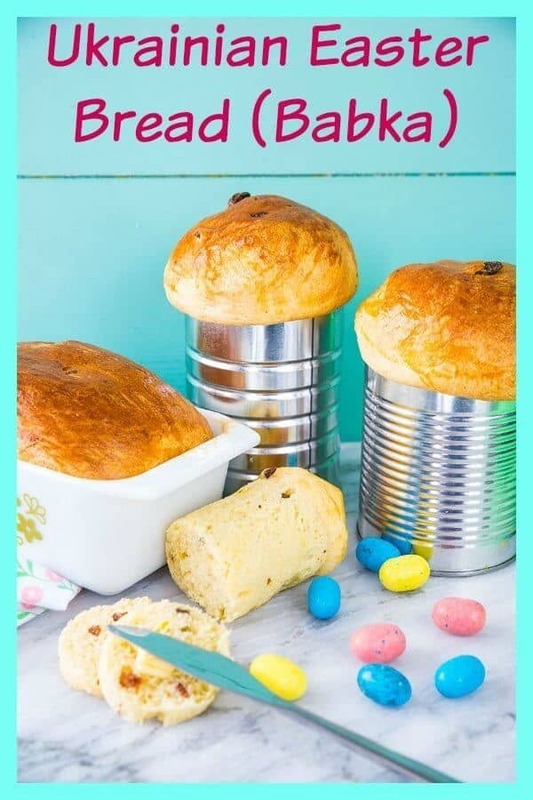 Easter Bread, or Ukrainian Babka, is one of the most beloved Easter traditions in my household. I come from a Ukrainian family and both of my Grandmother’s would make Babka every Easter. 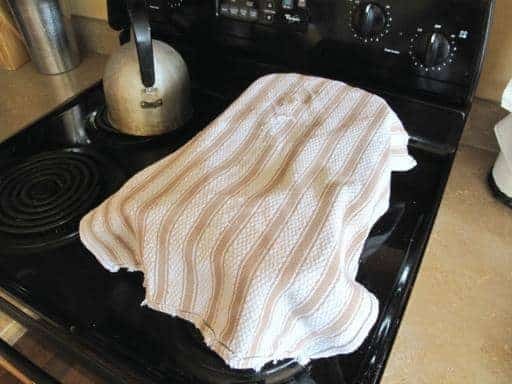 When my Grandma wasn’t around to make it, my Mom would then take over. 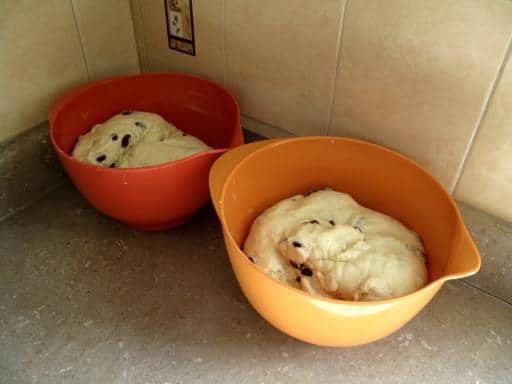 I have been making Easter Bread since I had my own children and have taught them the tradition as well. This post was updated March 20, 2018 to include some new photos and a how-to video! I have left my old step by step photos in the post as they are very important and helpful! It isn’t Easter in my household until we eat this bread for 4-5 days until we have our fill, then are sated for yet another year. This recipe is called Babka by mainly Canadian Prairie Ukrainian settlers, as it has been argued ( as you can read in the comments!) that this is Paska. Now, here on the Prairies my Mom and Baba swore up and down that actual Paska is not a sweet bread, is braided and has no raisins. Here on the Prairies we tend to actually have our own little culture when it comes to being Ukrainians. We pronounce kielbasa as ” koooo-basa” – which is the ONLY place that it’s pronounced like that! Isn’t that strange? It’s a uniquely Canadian prairie version of saying the word, however with our very large population of Ukrainian settlers it’s no less authentic, just as calling this Babka is no less authentic. Ways and words were changed when my ancestors arrived here and adapted to a new life. Also on another interesting note, it’s unique to the Edmonton area that we spell it “perogy” instead of pierogi. We have a Perogy House here, it’s just how we spell it sometimes! 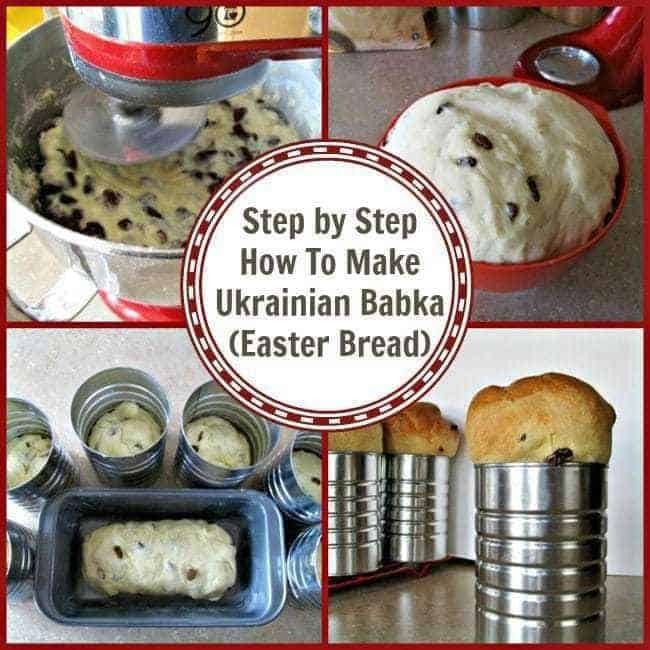 What is Easter Bread or Ukrainian Babka? It is a light, buttery yet slightly sweet yeast bread with raisins, baked in coffee tins and is so fantastic toasted with some butter on it. Or plain with margarine. Or toasted with anything on top. It is also a labor of love and takes a few hours. 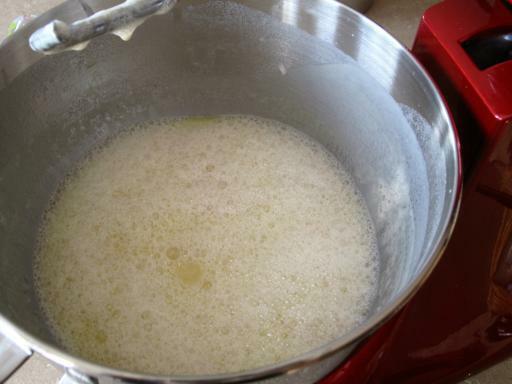 Now, I put the butter, milk and 3/4 cup of white sugar in a pot and brought it to a near boil, you want to slightly scald the milk. Then I called my mother and during that conversation she mentions that she throws it all into the microwave and nukes it until it’s incredibly hot. Now, that is certainly not how my predecessors did it. However, this modern woman on her second batch used the microwave. Now you have to let the mixture cool and adding in that cup of water certainly helps, thus the reason we leave it until the end here. Take the warm water and 1 tsp of sugar, mix in your yeast thoroughly and let it start bubbling away. 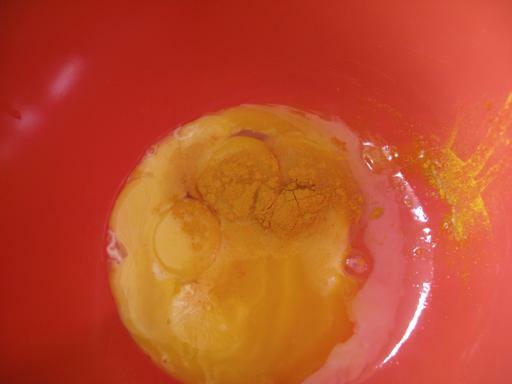 Beat your egg yolks and tumeric. The tumeric gives the bread it’s lovely color. 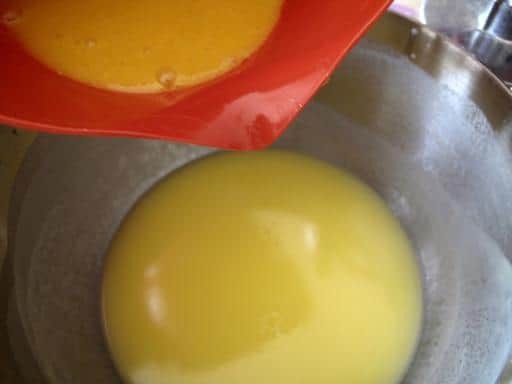 You can also use 3 whole eggs instead of the 6 egg yolks but the yolks make a richer bread. So 3 eggs OR 6 yolks, folks. Add it to the cooled milk mixture. 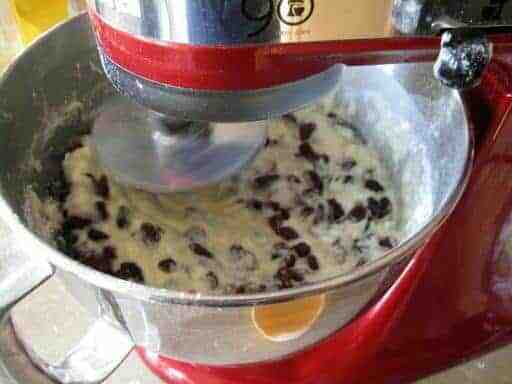 I used the mixer for this now because it is one heck of a job. 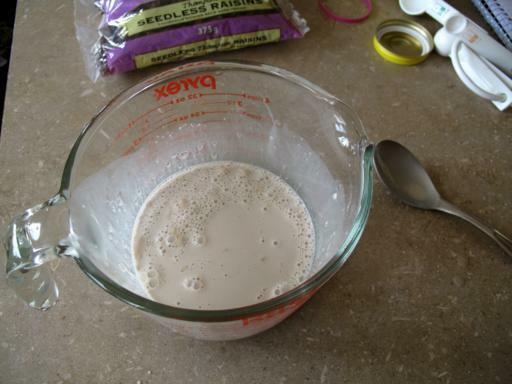 Mix the salt into the flour then add in the first four cups of flour, then your raisins. Then slowly add another 4-5 cups until the dough is slightly sticky. Once that’s done it needs to rise. Put it into a bowl(s) in a nice warm place. Grease the ever lovin’ heck out of those coffee tins. I only had 6 this year, so you can also use a loaf pan as well. This would make a perfect 7 tins. Time to let it rise again, I had a nice warm stove from banana bread so they sat on there. Let them rise until they are almost at the top. They will rise in the oven as well when they start baking, which is why you want them only to rise barely to the top of the tin. Cool very slightly in the tins then remove to make sure the bread doesn’t sweat and the bottoms don’t get soggy! Happy Baking you guys! I am so happy to share this recipe with you, it’s our family tradition and I’m thrilled that you can bake it as well! 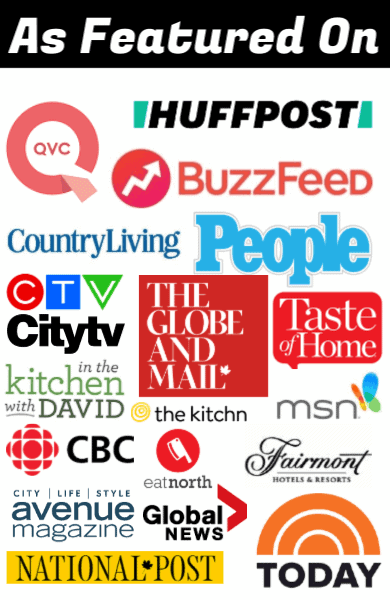 Pin This To Your EASTER BAKING Board and Remember to FOLLOW ME ON PINTEREST! Once that's done it needs to rise. Put it into a bowl(s) in a nice warm place and cover it with a damp tea towel. Once it's doubled in size, it's time to punch it down and put it in the tins to rise again. You want to fill the tins only half way with punched down dough, this dough rises like you wouldn't believe! Grease the ever lovin' heck out of those coffee tins. (I use the medium size, the 13-16 oz coffee tins, NOT the large ones!) This would make a perfect 7 tins. 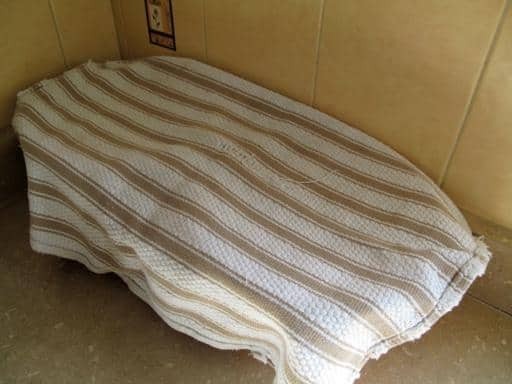 You can also make it in a loaf pan. Bake for 30-40 minutes on the very bottom rack, the tops get very golden brown but don't fear, the inner part has to cook and the tops get brown and stay brown. Cool very slightly in the tins then remove to make sure the bread doesn't sweat and the bottoms don't get soggy. Cool on racks for a couple of hours ... if you can wait! Glaze the tops with my Buttery Icing Glaze if desired! Is it possible to use the large tomato cans? Or would they be to small I’d really like to try the canned method but have no coffee tins. Sort of disappointed because I had to use loaf pans! Here in the U.S. I haven’t seen coffee in a can in about 20 years. Recipe really rates more than 5 stars! thanks for sharing! The metal Coffee cans are so hard to find now! I like vex baba bread. Thank you so much for your post the bread looks delicious. I use parchment paper in my tins. The bread goes straight up instead of ballooning over the tin & I have never had a problem with the bread sticking in the ridges. Also I cut out a circle for the bottom. This is an amazing paska recipe! Every Easter I would look forward to my baba’s paska. Now, at 101 years old, my baba has passed this yearly task on to me. While my baba’s recipe is great, I find her method a little too labour intensive and have tried several other recipes, none of which compare to my baba’s. I have to say that this recipe, while not only easy and straightforward, produces paska that is as good as (if not better) than my baba’s. When I shared a loaf with my baba, she was very impressed with the flavour and texture….you know a recipe is good when it is “baba approved!” Thank you, for sharing this recipe!! I followed your very detailed recipe, step by step, and made paska bread for the very first time. It turned out great and I think it will be a new family tradition. Thank you for the recipe and great details! 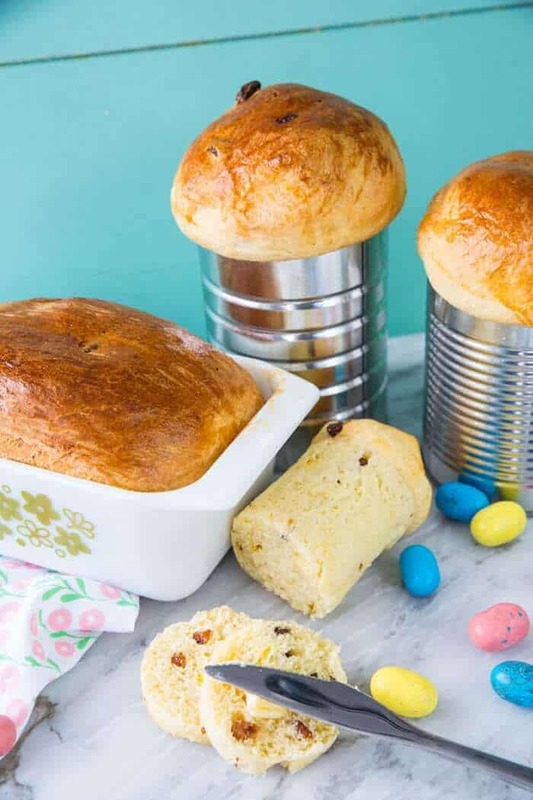 Hello and Happy Easter, just read your recipe and must comment, we are from Saskatchewan, Canada and there are lots of Germans out here, We also make this easter bread and call it PASKA. 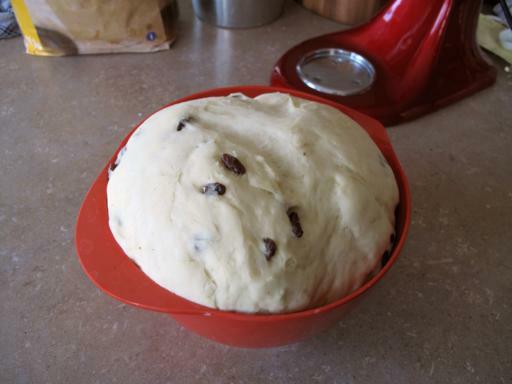 A little different take is that we soak our raisins in rum overnight and this gives it a little extra flavour. Other wise looks the same as we make, can’t beat the Easter Bread. Any thoughts on doing one of the rides overnight in the fridge? I cut your recipe in half because of not having enough cans and turned out super good, will be baking more and I also line my cans with parchment paper, the loaves slide right out nicely, not sure if the parchment would affect the baking or not. Very good recipe, thank you !! Moved from Chicago to Philadelphia in 1994. Havent had proper (my mom’s) babka since then. 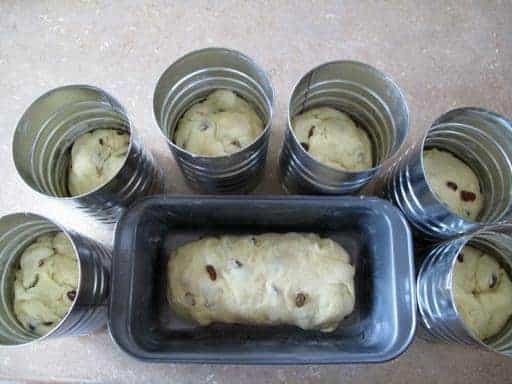 Unfortunately she passed away in 2014, and did not leave recipe, but seeing that you baked the babka in a coffee can like she did, that’s one plus for you. Another is correct pronunciation of kielbasa (koo ba sa, take note people!!). Third plus, i have Ukrainian friends from Winnipeg, so i know i can trust you when you speak of Canadian Ukrainians on the prairie. Looking forward to trying your recipe! Well, I was born in Winnipeg, so I have some ‘Peg Street cred lol. Both sides of my family hail from Dauphin, Manitoba. This is absolutely a traditional Babka recipe and I hope it’s really close to your Mom’s! My son’s girlfriend is Ukrainian and I would like to try and make this for her. I’ve made bread before in the past and didn’t do well. Is this recipe hard for a beginner like me and can I cut this recipe in half. This is a pretty easy and forgiving bread recipe and yes, you can cut it in half! I have made something similar to this and it tastes amaaazing!! 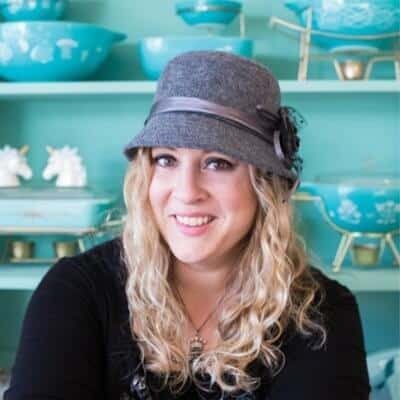 Thanks for sharing this recipes. 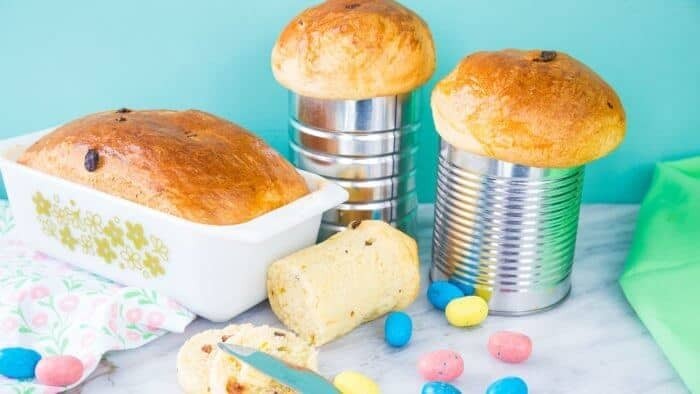 I will have to attempt to make it for Easter! Love having this toasted! SO good. Perfect for Easter! Thanks for this! This looks so good! I am going to have to try it this Easter! A woman in my building bakes babka as a fundraiser for the Leukemia & Lymphoma Society – at Easter and Christmas. They’re great!